Following the successful introduction of the ARCHOS 50 Saphir smartphone, ARCHOS unveils the ARCHOS 101 Saphir tablet, a durable and reliable 2-in-1 tablet with a keyboard. Especially meant for hikers, riders and outdoor workers, it combines a 10.1-inch IPS HD screen, a quad-core processor, 1GB of RAM, 16GB of internal storage, and 2 cameras, a built-in GPS and USB Type-C / micro HDMI slots, all in a rugged casing. 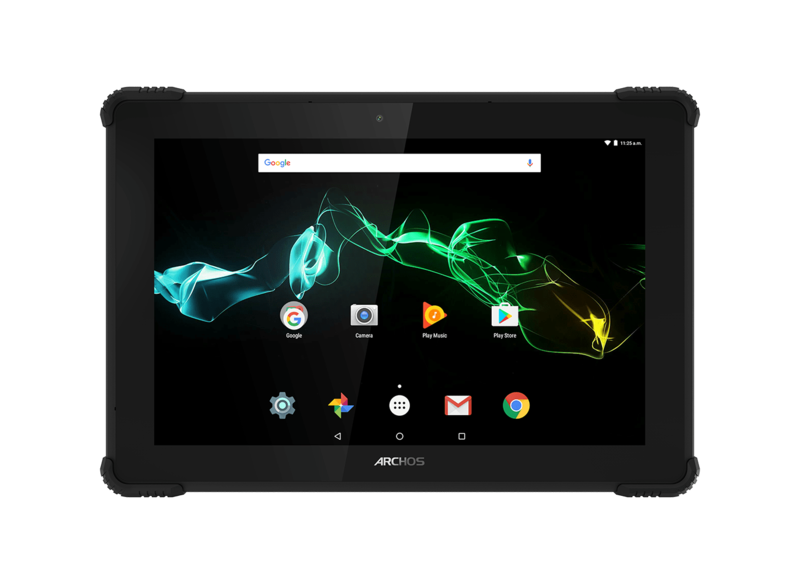 Demonstrated next week at MWC 2017, the ARCHOS 101 Saphir will be available just before summer at £130.00. From drops to water splashes, electronic devices damaged at home have cost families billions. At the same time, rambling has never been so hype and hikers or riders want their tablet in their backpack. Even outdoor workers are looking for robust cutting edge technology to increase their productivity on the field. ARCHOS, who was the first to introduce a Google Android tablet in 2009 and who additionally benefits from the long track record expertise of its Logic Instrument subsidiary, leader in embedded and rugged mobile systems for hostile environments, therefore designed its new tablet in a rugged casing, which can survive drops (up to 1 meter), dust and water splashes, as per the IP54 standard’ specifications. The ARCHOS 101 Saphir sports a brilliant 10.1-inch IPS HD screen, delivering a 1280×800 pixels resolution, with an optimum clarity and wide viewing angles, to look at pictures, watch videos, use favourite apps and social networks, either from a sofa or in the bright light on top of the Himalayas or on worksites. It is powered by a 64-bit Mediatek quad-core processor at 1.3 GHz, along with 1GB of RAM, 16GB of internal storage, thus capable of running multiple apps and videos at the same time. The ARCHOS 101 Saphir embeds two cameras: 2MP at the front and 5MP at the back, to catch and share life’ best moments. It is equipped with a built-in GPS, making it easier to get the most out of the web and preferred apps. The ARCHOS 101 Saphir packs a 6000 mAH battery, to get through the entire day. It runs Google Android’s latest release, Nougat, with a bunch of new features: split-screen mode, quick reply to notifications, and revamped settings and toggle menus, making the tablet even friendlier to use. And as a Google certified device, the ARCHOS 101 Saphir gives access to the Google Play Store with its 1.4 million apps, games and books. It offers all the essentials and even more in terms of multimedia: an audio jack port, a keyboard, 2 speakers, as well as USB Type C and micro HDMI slots – to enjoy any content on the go. The ARCHOS 101 Saphir will be exhibited on ARCHOS’s booth at MWC 2017 (Hall 6, Booth #B60). Exact specifications, prices, and availability might vary by country. They will be specified when the tablet is launched, in June 2017. Seasoned tech blogger. Host of the Tech Addicts podcast.